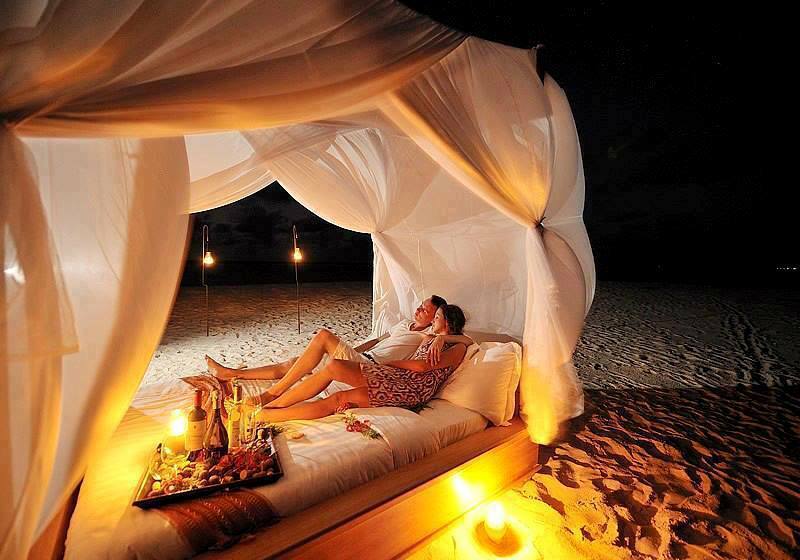 Think of the Maldives and you immediately think of the perfect most romantic holiday destination in the world. The pure white sand, lush green vegetation, rich blue of the ocean and sky, and turquoise of a thousand lagoons make the tropical Maldives islands one of the romantic picture postcard destinations of the world – but while it is regarded as one of the top honeymoon destinations of the world, it is also the perfect spot for every traveler to enjoy.Whether it is snorkeling or scuba diving; exploring isolated cays, coves and coral reefs; cooling off in a tranquil lagoon; or just standing still and taking in the breath-taking natural beauty of the area, your visit to the Maldives is something you will never forget. The Republic of Maldives is a string of 1190 islands are spread over 26 atolls, with ring-like coral formations enclosing a lagoon, which gives the Maldives its unique paradise-like appearance. They stretch for about 820 kms from north to south and 130 km at the widest point. 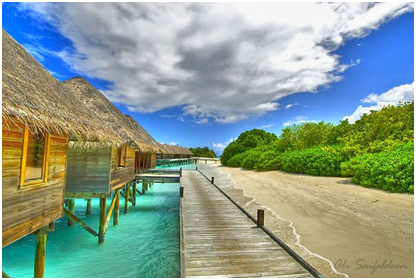 The atolls of the Maldives are formed from coral structures, separated by lagoons. The islands are low lying with the highest point being just over two metres above sea level. 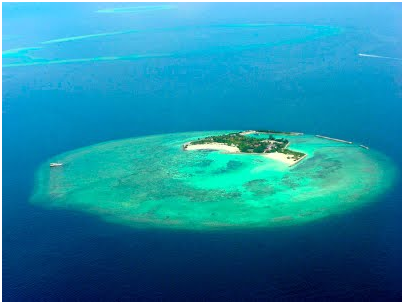 The ring-shaped reef structures form the atolls and these reefs provide natural defense against wind and wave action, on these delicate islands. 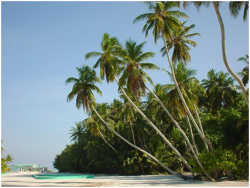 While the capital Malé is the centre of trade, commerce, business, health and education, only about 200 of the islands are inhabited, with the balance being 87 tourist resorts and deserted islands. More than 90% of the Maldives is covered by the sea, so if you are thinking of visiting there are no deserts, safaris, ski trips of mountain climbing to consider. You can only lie back and enjoy the culture, serenity, the beauty of nature and the sounds of water lapping gently on the pure white sand. 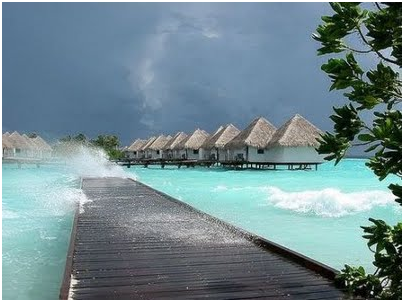 The Maldives is voted as one of the best holiday destinations in the world. Check out the other holiday destinations that have been voted the best holiday destinations. The chic, 100-villa resort on Mudhdhoo Island opened in February and is near Hanifaru Huraa, a UNESCO World Biosphere Reserve that is a feeding ground for manta rays and whale sharks. Activities include diving and snorkelling. The centrepiece is an infinity swimming pool designed around an ancient banyan tree. Devarana Spa has six tree-top treatment pods among the coconut palms. 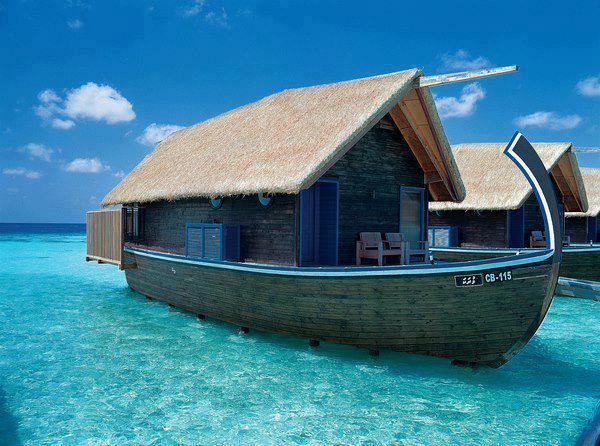 Villas from $750 a night. A RELAXING day spa need not be a luxury reserved only for adults. The Maldives Hilton now offers spa treatments for kids and families. HILTON Maldives Iru Fushi Resort and Spa has begun offering day spa treatments for children. The Sweet Pea Spa treatments have been designed especially for young skin, with mother and daughter and father and son packages available. The resort has 20 individual spa pavilions, including five Ayurvedic suites, plus hydrotherapy and plunge pools, a sauna and steam rooms. Signature treatments include Peas in a Pod, in which treatments can be chosen from the child and adult spa menus. COSTUMES worn by Anne Hathaway in Les Miserables and Keira Knightley in Anna Karenina have gone on display as part of a new exhibition at Universal Studios in Hollywood. They include the tattered dress worn by Hathaway in her Oscar-winning portrayal of Fantine and the coronation dress worn by Kristen Stewart in Snow White and The Huntsman. The NBC Universal Experience also showcases original drawings from Universal Pictures' classics such as Jaws and Dracula. The costumes will be on display until at least July before they are replaced with other outfits. A NEW Shangri-La hotel will open in Shanghai, China, next month. The 60-storey Jing An Shangri-La in West Shanghai is in a new complex with shops, offices and apartments. All guest rooms will have heated marble floors in the bathroom and an LCD TV and digital clock embedded in the bathroom mirrors. Its Horizon Club Lounge takes up the 55th floor, with 360-degree views. AUSTRALIA'S longest-running health retreat Camp Eden has been given a new name after undergoing a multi-million dollar refurbishment. Eden Health Retreat, at Currumbin Valley in the Gold Coast hinterland, has had an outdoor spa added, rooms and dining pavilion upgraded and extensive landscaping around the pool area. The retreat opened in 1984 on 120ha of rainforest and offers tailored programs offering activities such as laughing yoga, qigong and kayaking. MERCURE Sydney, in the city's entertainment precinct, is undergoing a major makeover, with the Broadway hotel set to unveil its contemporary new look in spring. The 517 rooms will have purple and grey interiors and dark marble bench tops with new mirrors and glass shower screens in bathrooms. It also has an undercover rooftop swimming pool, sauna and gym with views of the city skyline.